Tumbleweed emerged from Wollongong in the early ’90s with a brand of fuzzed-out psychedelic hard rock that went hand in hand with the emergence of the grunge movement, propelling the band into the national and international spotlight. Now, twenty-five (plus one) years on, the band are touring Australia again to play their momentous first album live in its entirety for the first time. 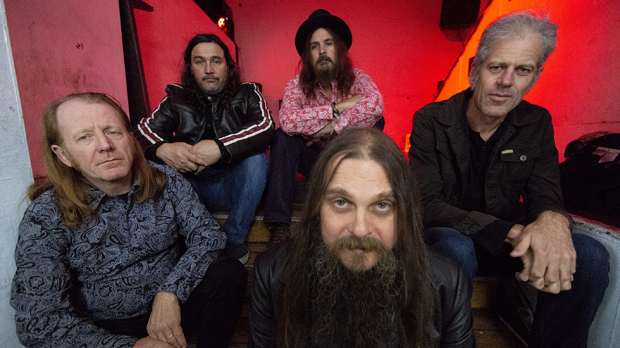 MICHAEL HOLLICK had a chat with lead-singer Richie Lewis about the band’s origins, what it’s like for them to revisit their first album and to find out all about the current, happening scene in the ‘gong. What has Tumbleweed been up to recently? The most recent incarnation of the band came about when we asked to play with our friends, Spiderbait, on their Ivy & The Big Apples tour. Initially, we were a bit reluctant, thinking; we don’t really have a bass player and we don’t really want to get one and go through that whole rigmarole, as well as having respect for our initial bass player, Jay, so it was an icky tricky situation. And we didn’t want to think about it too much. Luckily though, Jamie was put forward. He’s been on the periphery of Tumbleweed since the early ’90s, playing in other Wollongong bands, such as Shifter and Dawn Patrol, as well as playing bass in Lenny’s other side project, The Pink Fits. It was an easy decision in the sense that he was the guy to get. We had a couple of jams with him and it felt right. We have done a couple of shows now with him and the A Day on the Green tour earlier this year and he’s fit in to the band really naturally and given it sort of a new spark, he’s excited to be doing all these things. How did this tour come about, celebrating and playing Tumbleweed’s self-titled first LP in its entirety? We have this local record company here in Wollongong called Farmer & the Owl and they asked us if they could press up some vinyls of our first album for Record Store Day, which we followed up with an in-store show on the actual day. We turned up, and did that and it was a big local thing. In my head I was thinking that they must be saying, “great, here’s some old farts from the old days coming in and playing their music in the shop”, but you know, it was really packed and really fun. Afterwards, we had a lot of people on Facebook asking about it, because this was the first time that we had played the whole record from beginning to end, so we thought let’s take this thing on the road. What has it been like to revisit that first record? It has been exciting to play all the songs that we have never played before. We discovered that there is one song on that record, Sundial, that we always play, occasionally we have played God or Ocean, but some songs, like Dandelion 1 and Dandelion 2, are things that we have not played since we recorded them. And we’ve never played Darkness At Never Ever which has some cool acoustic guitars on it, so it’s been a good artistic challenge to try and recreate those live and make that work. I believe there’s a bit of a scene in Wollongong at the moment. What can you tell us about that? There’s a lot of stuff coming out at the moment. Bec Sandridge has just gone on the road with The Smith Street Band. She’s from Stanwell Park and part of the Farmer & the Owl catalogue. And then there’s The Pinheads and Totally Unicorn who are both doing pretty good things. So yeah, it’s quite a happening place at the moment, it’s quite a healthy scene. And there’s Shining Bird and Tropical Strength and Homewreckers. There’s a lot going on. Was that always the case in Wollongong? No, thirty years ago we had this place to ourselves, and now all these upstarts have just come along and taken over. Why do you think those changes have occurred? It’s happened in spite of all the political red tape of the town and pubs being owned by the same group, they’re not cool. But the kids, people with passion, and a little bit of enterprise get out there and start things like Rad Bar and they started Music Farmers and Farmer & the Owl and Yours & Owls, and that’s happening just because of their passion and for their friends, and how a real scene is supposed to happen and come about and become popular. It hasn’t hit critical mass yet, so it’s still very exciting times. Staying in Wollongong, back relating things back to Tumbleweed, do you think it’s easier or more difficult these days for bands to get up and going? Well, when we started, you definitely needed a label to get any sort of traction, to get around the country, and definitely to get overseas. These days you can create your own presence digitally and you can market yourself in your own way and you have more freedom and more access to a catalogue of great music. For me growing up, you would follow a sort of pathway, where you would find out about one band, and then after that you would trace back to the bands that inspired them, and listen to that, and so on. Plus, you have to put in the groundwork, like take a train to Sydney to get the actual, physical vinyl. So nowadays, that side of things has become a lot more convenient for producing and does make for creative and less homogeneous styles of music. On the other hand, I think it would take a lot more to stand out, people have seen it all. Like, you’re accepted, but at the same time, not noticed. So the modern times have created their own challenges, while there were aspects to the period when we grew up there were advantages. So where did that original Tumbleweed sound came from? What was the musical and artistic atmosphere like at that point in time? So, I think there was that little bit of a movement, and that’s why the grunge movement worked, it was a very real time. And we (Tumbleweed) were caught up in that movement, locally and globally, and then things just moved and happened. It was all quite organic. Is it that “movement” that keeps you going and keeps you inspired? I guess it doesn’t need to be rock, that’s just our thing, and it has worked for us. Personally, I like original thoughts and original ideas and I try not to get stuck into any particular genres and I think that sort of thing comes from the spirit within, it’s an undefinable thing. This passion that is true, and even if it can be a bit jokey, that can be okay, it’s sort of like the intent behind a creation comes through, and it either resonates with me or it doesn’t. I find if that shines through, then regardless of the genre then I am pretty open to it. And that’s something I, and the band has always aspired to do. Not wanting to sound like a complete wanker or anything though.